A great way to say thank you, and promote your organization. 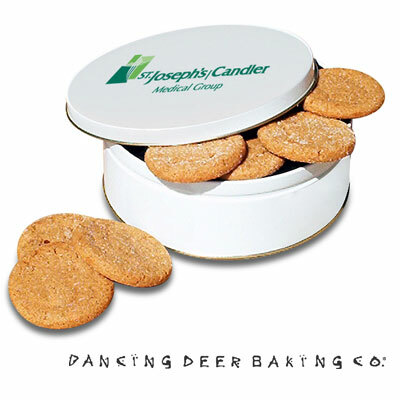 24 prize winning cookies from Dancing Deer Baking Co. Packed in white tins with your message on top. Tin measure 7in x 2-3/4in ; white. Fresh baked cookies: choice of Molasses Clove (shown), Double Chocolate, or Chocolate Chip. Setup Charges may apply. Contact us for details.